The Lindsey Volunteer Fire Department knows how stressful an emergency can be. In the case of any emergency, getting accurate information quickly could save someone’s life. Once first responders arrive, things can be hectic as we are inquiring about the medical history of the individual(s) who need assistance and the events leading up to the call for help. One way the we would like to help ease this stress is by asking you to take a few minutes to complete an Individual Medical History Form for each person in your household. You can even complete forms for people that may visit on a regular basis including grandchildren, grandparents, siblings, other family and/or friends. Once you have completed the Individual Medical History Form, place it in the transparent plastic envelope provided and place it on the front door of your refrigerator in an easy to identify area (i.e. right top corner). 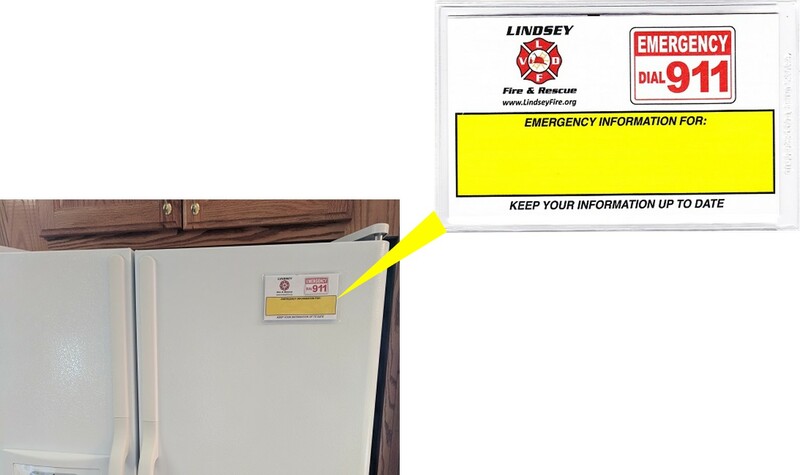 Up to 4 forms and transparent plastic envelopes are provide FREE to residents of the Lindsey Fire District as part of our Community Outreach Program. Just complete the request form below and we will mail you the materials. If you have questions, please contact Deputy Chief Jason Conklin at 419-680-4026 or jconklin@lindseyfire.org.